Day 1 - NEUSCHWANSTEIN: One of the most famous castles in Europe, Neuschwanstein (New Swan Stone) was built by King Ludwig II who was fascinated by tales of knights and dragons. 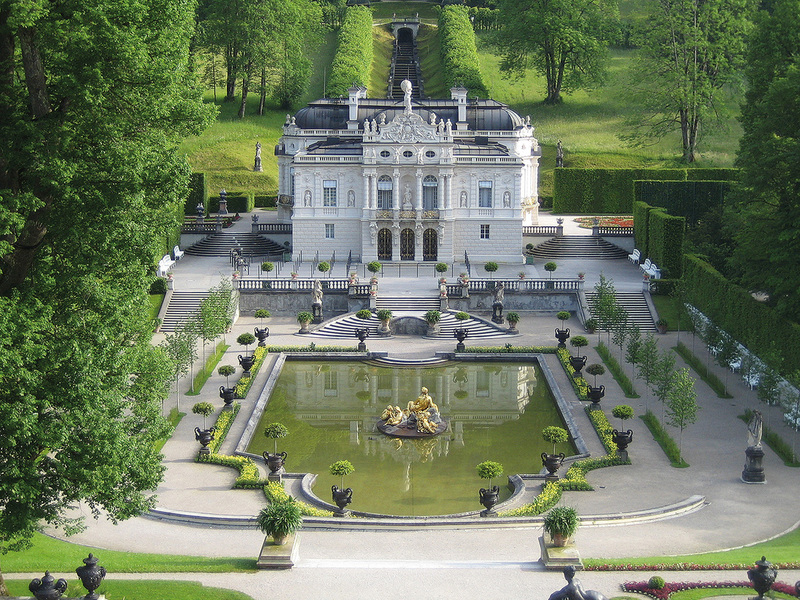 This castle was built as a private retreat for the somewhat eccentric Ludwig --in fact, many called him Mad King Ludwig. He didn't like to seen by people, which is a bit of a problem when you are the king. Believe it or not, Ludwing on spent 11 nights in the castle. I wonder what he would think if he knew that Neuschwanstein is now a tourist attraction that sees more than a million visitors a year and more than 6,000 visitors a day during the summer. Day 2: Neuschwanstein changes with the seasons. 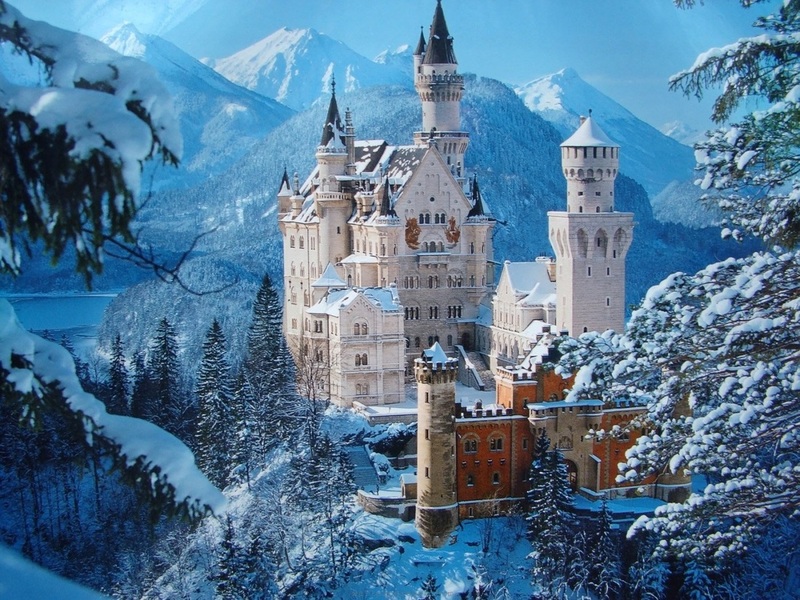 In fact, the castle is a favorites for calendars. It seems impossible for such a huge fairy tale-like castle to be sitting so high in the mountains. 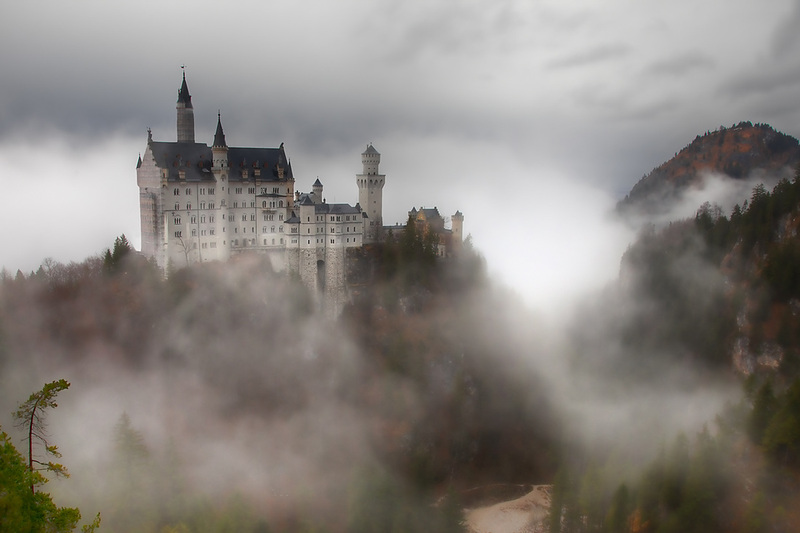 The landscape makes the castle appear even more like it belongs in a fairy tale. The castle is one of the most photographed buildings in the world, even if photography is not permitted inside of the castle. 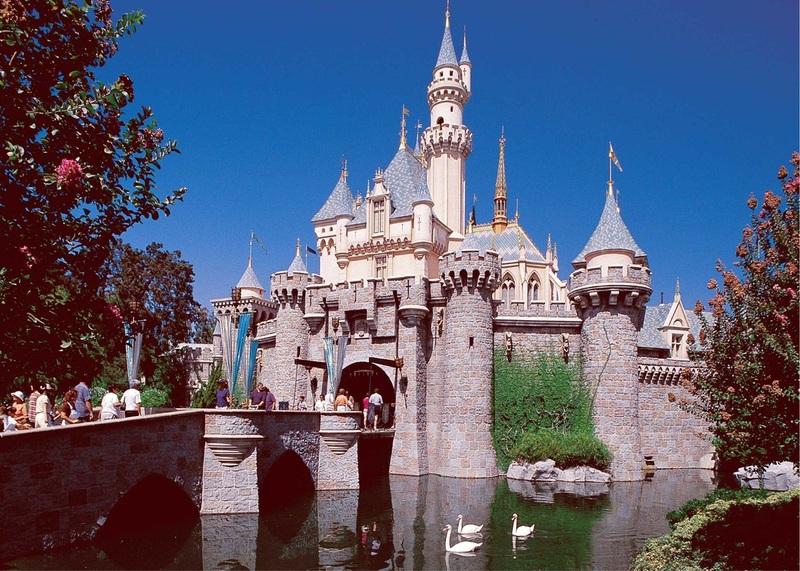 It's no wonder that Disney used Neuschwanstein as a model for Cinderella's castle in Disney World and Sleeping Beauty's castle at Disneyland. The inside of Neuschwanstein looks much like you might imagine a fairy tale castle to look, however only 15 of the rooms were completely finished when Ludwig died. 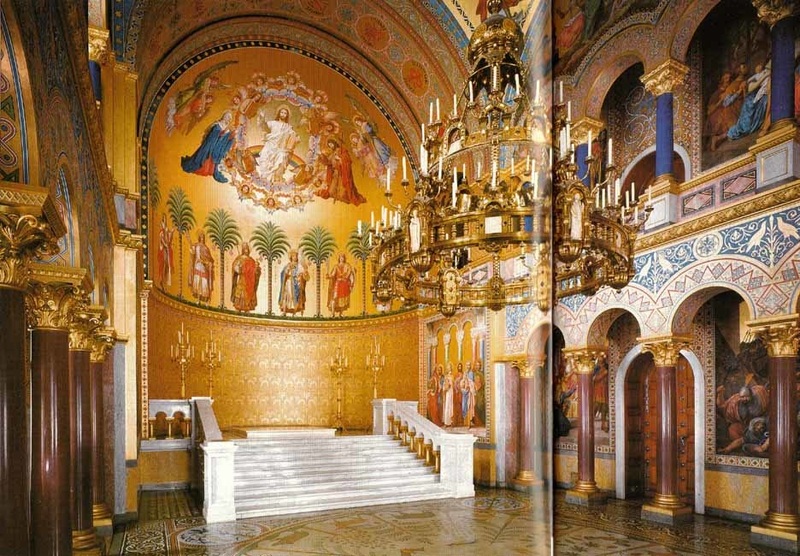 The Throne Room is the combination of church and throne room. That shows us how Ludwig saw his role as king: he saw himself not just as a king by God's grace, but also as a mediator between God and the whole world. 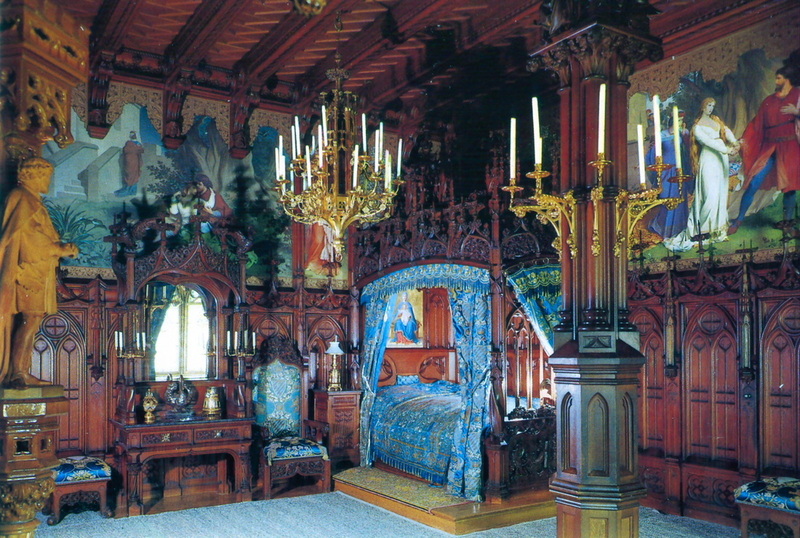 As in all the residences of Ludwig II, the king's bedroom is particularly sumptuous. The leitmotif is the legend of Tristan and Isolde, and the two main characters feature not only in the murals, but also in the carvings on the door and the ceramic figures on the tiled stove. 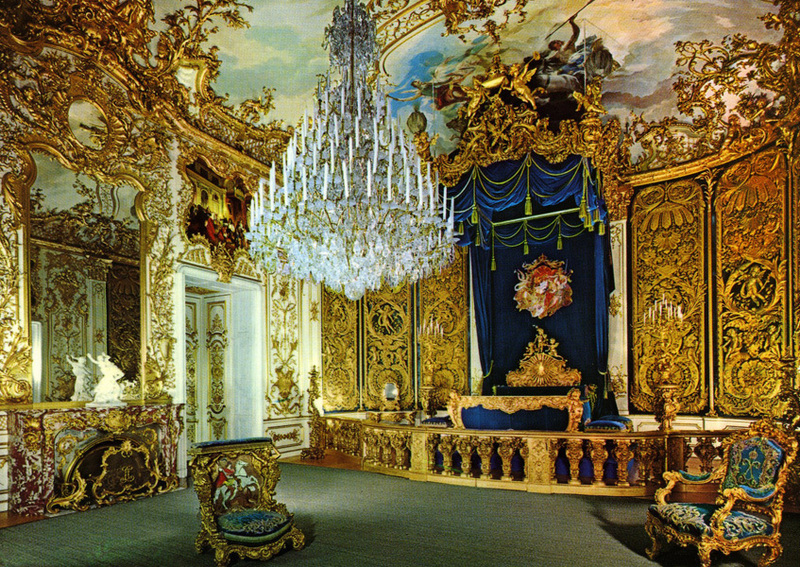 The king's bedroom was lavish. It was decorated with lions, swans, crowns, lilies and the Bavarian coat of arms and had paintings from his favorite opera, by his favorite composer, Wagner. The Singers' Hall was one of the king's favourite projects and next to the Throne Hall the most important room in the castle. It occupies the whole of the fourth floor. 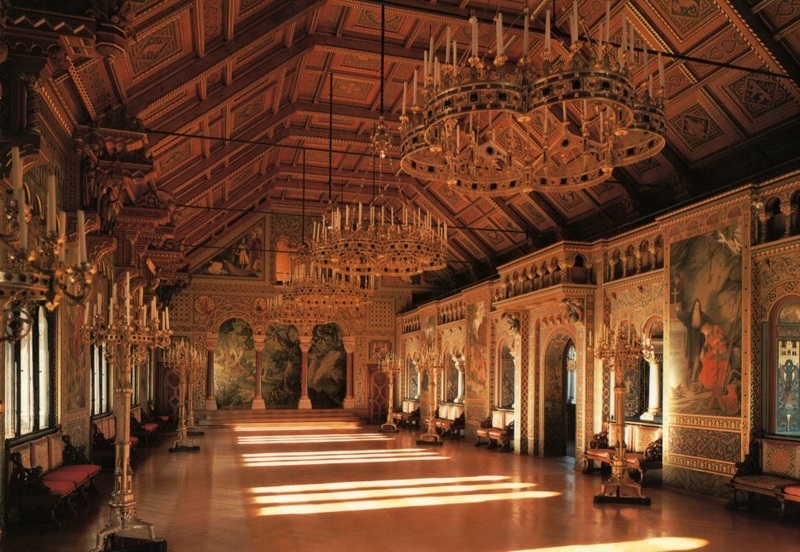 Like the Throne Hall, this hall was also never used for large banquets or musical performances: it was Ludwig's monument to the knights and legends of medieval times. 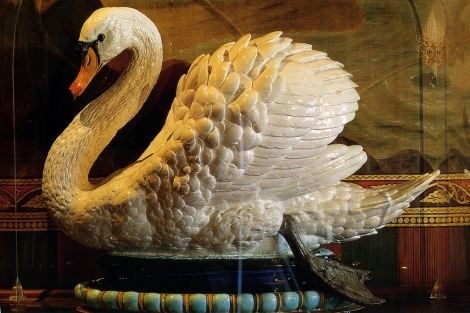 Swans: Some say Ludwig’s obsession with swans began when he saw Lohengrin for the first time. Richard Wagner’s opera tells the story of the Swan Knight and his quest for the Holy Grail --swans can be seen over and over at Neuschwanstein. 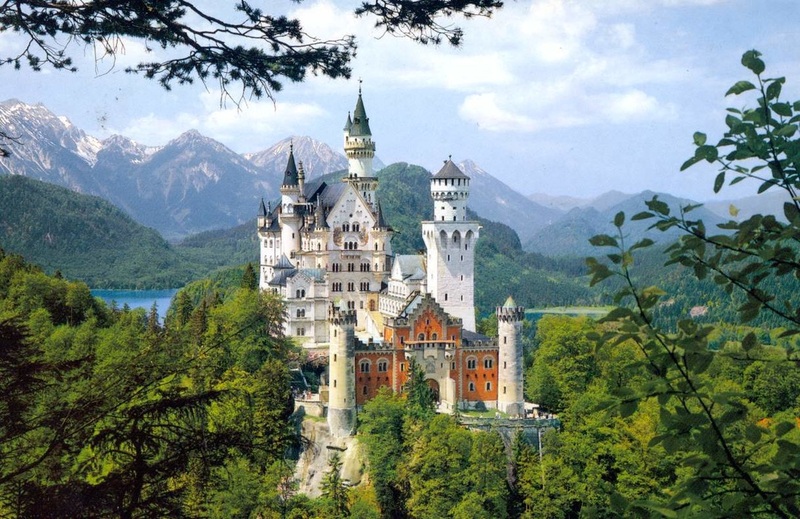 In Neuschwanstein, the world of a fairy tale castle was only an illusion: behind the medieval appearance of the castle the latest technology at the time was in operation and every comfort was ensured. The rooms were fitted with hot air, central heating. Running water was available on every floor and the kitchen had both hot and cold water. The toilets had an automatic flushing system. 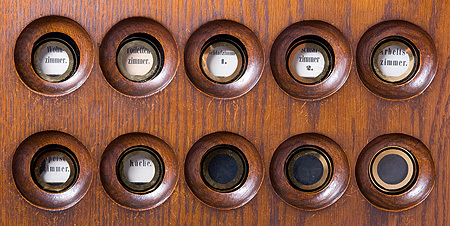 The king used an electric bell system to summon his servants. On the third and fourth floors there were even telephones. Meals did not have to be carried upstairs: for this purpose there was an elevator. 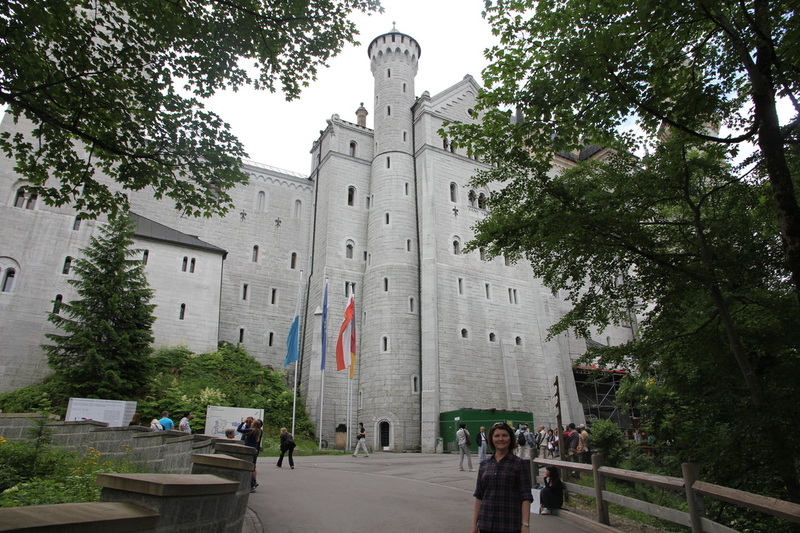 DAY 4: So what is it like to go to Neuschwanstein? Miss Hesse and Miss Hurdle went to this famous castle two years ago. They were excited to see it because, like you, they had seen pictures of it for years. 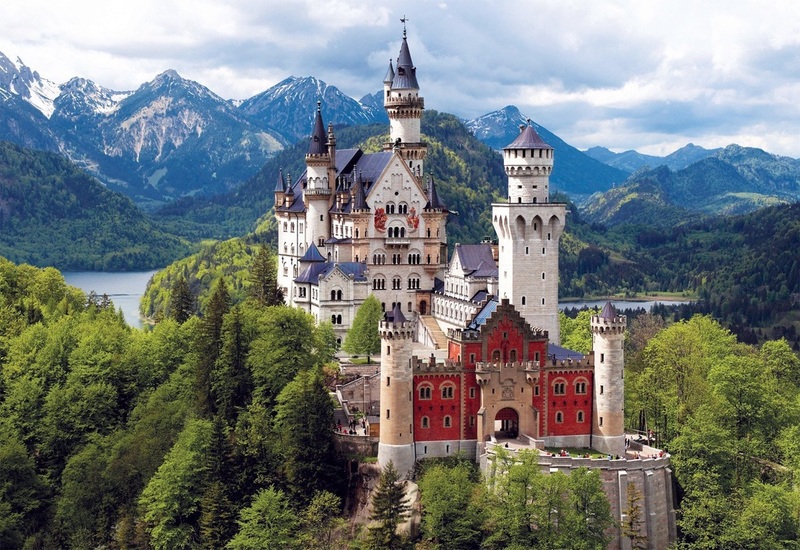 This is what they said about seeing King Ludwig's beautiful castle: "Neuschwanstein sits atop a mountain in the Bavarian Mountains of Germany. 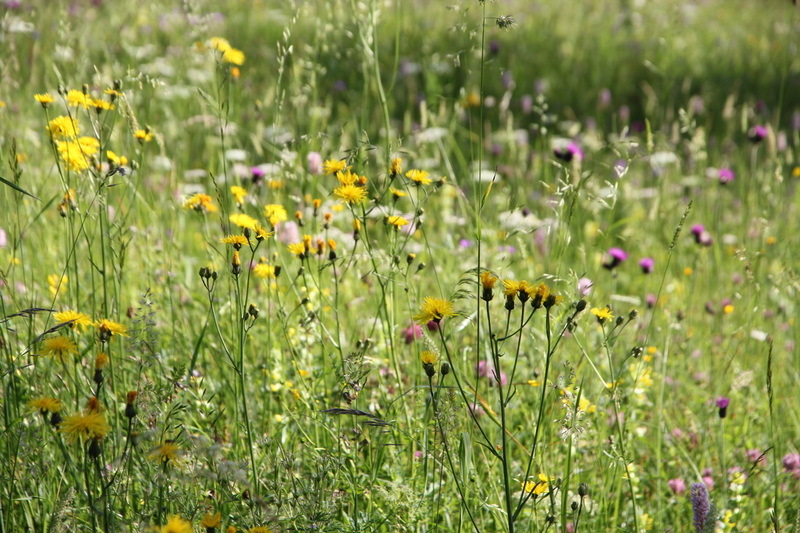 The landscape is green and covered with evergreen trees and wildflowers. 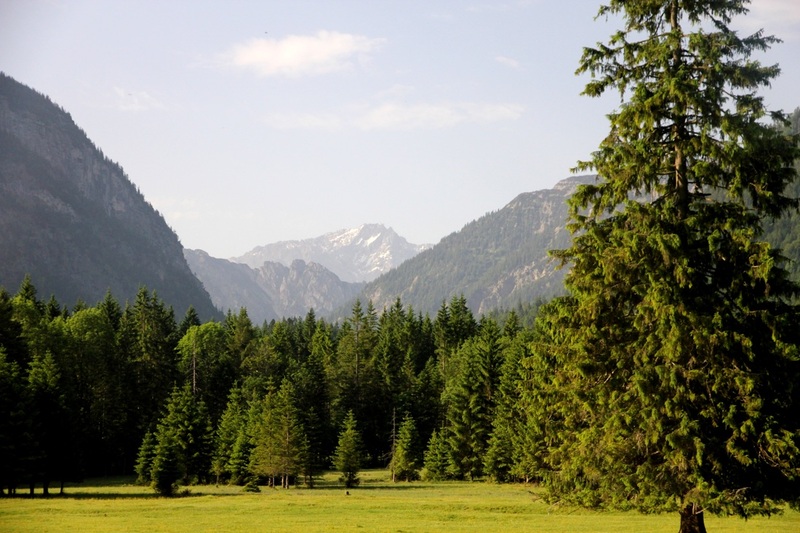 In fact, there are so many fir trees, it is easy to understand why the use Christmas trees began in Germany. 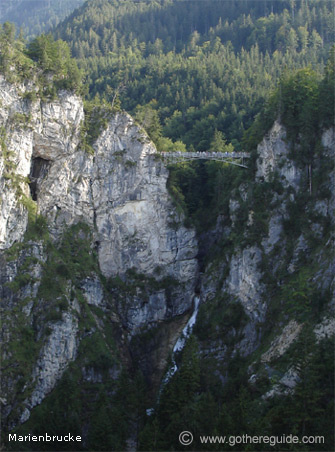 Riding through Bavaria, the mountains hid the view of the castle until we rounded a bend in the road, and there it was perched high above. We were so excited, but wondered we would ever climb that high! The answer is by foot (not many do this) or by horse and wagon. This is what we did. 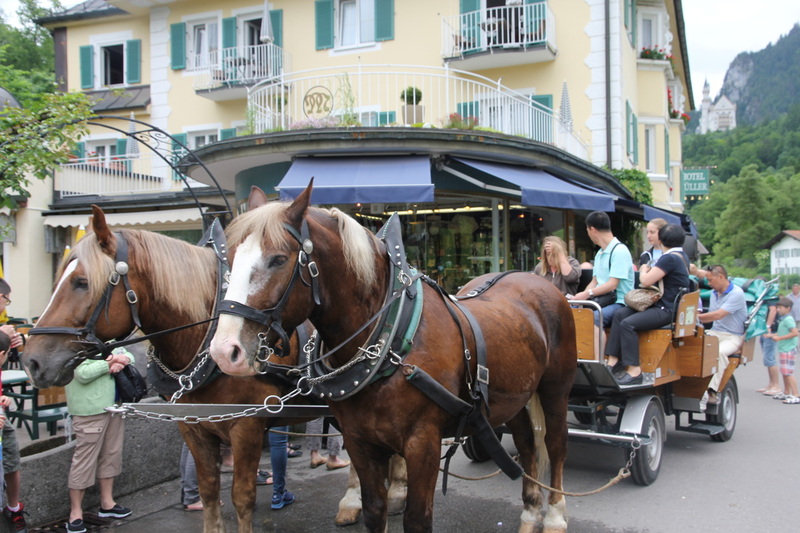 The horses are strong, draft horses and they know just where to go. Pretty sure they could go up that mountain without a driver. The castle is much bigger than it looks in pictures. We took lots of photos, but were sad that we were not allowed to take photos inside the castle. The inside looks just like what we thought the inside of a real fairy tale castle would look. Oh...we could have walked across a suspension bridge (that is a bridge that can sway) to get an amazing front view of the castle, but after we looked how far it was to the bottom and how narrow the bridge was we were too chicken. 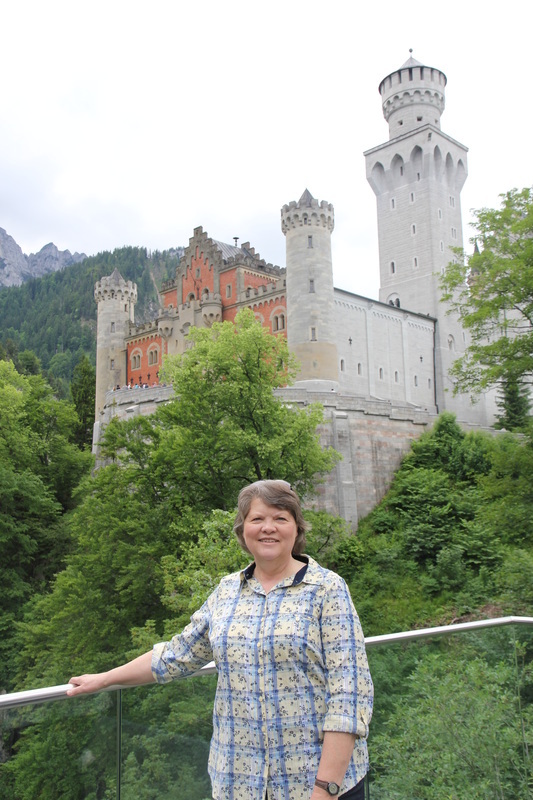 DAY 5: Oh, by the way... Neuschwanstein isn't the only castle Ludwig built. He spent money and spent more money. Many of the German people at the time were not too happy about that. Most of them were very poor. Today, however, the castles that he had built bring huge sums of money to Germany. 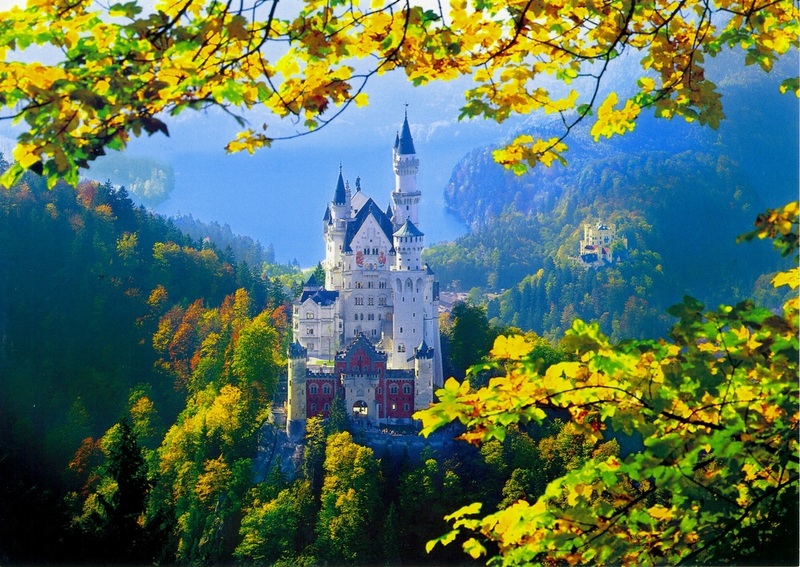 Tourists flock to Bavaria every year to visit his castles --which are actually pretty close together. 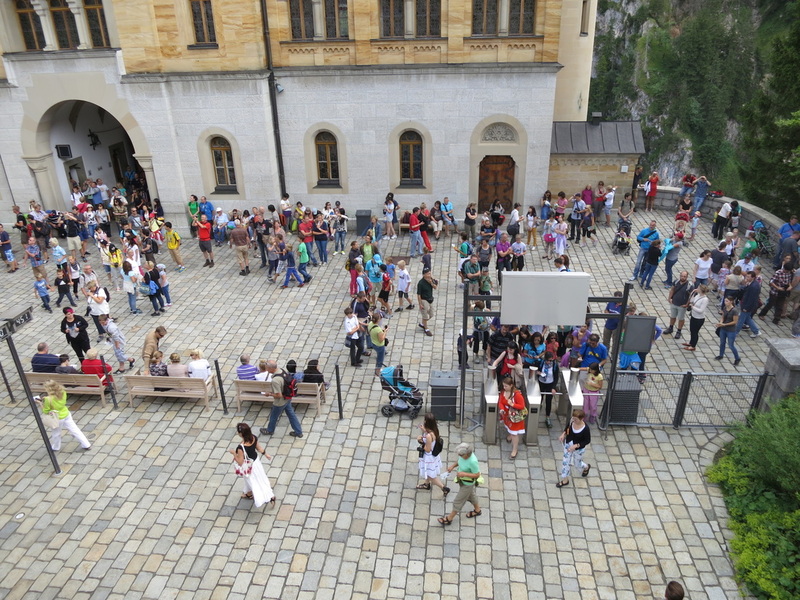 The tourists buy tickets, spend money on souvenirs, food, and lodging. Today, Ludwig is very popular with the German people. 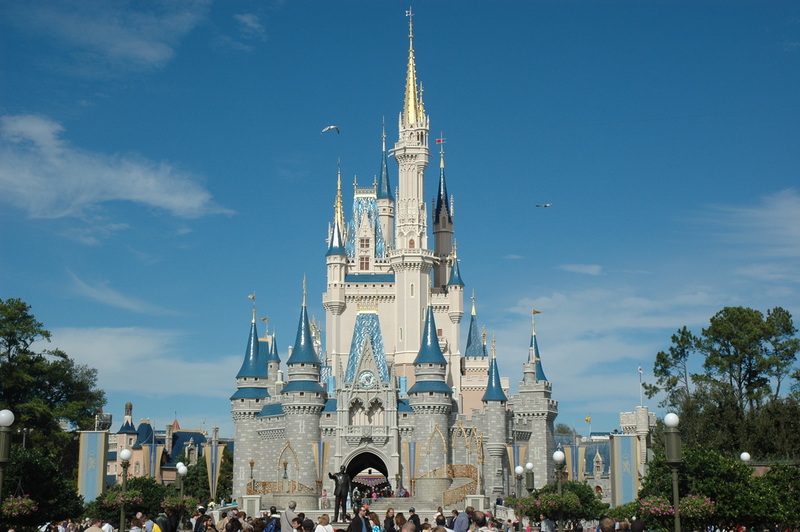 Let's look at his other castles! Linderhof Palace- This was where Ludwig spent most of his time. It was far away from everything so he could be alone. When eating there was even a table that appeared through a trapdoor in the floor completely set with china and food. When he was through eating, he pushed a button and it disappeared. That way he didn't even have to see the servants. His bedroom was covered in gold. 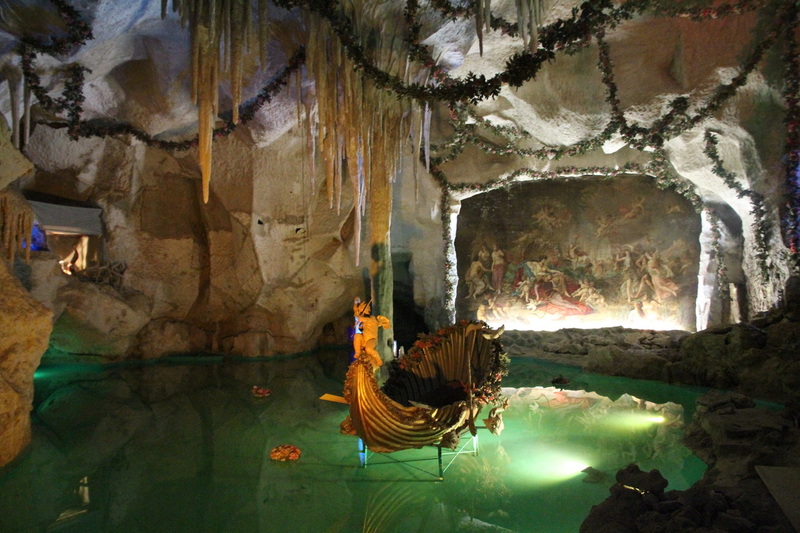 He even had a cavern or grotto built so he could hear his favorite Wagner compositions performed inside a place with great sound and atmosphere. 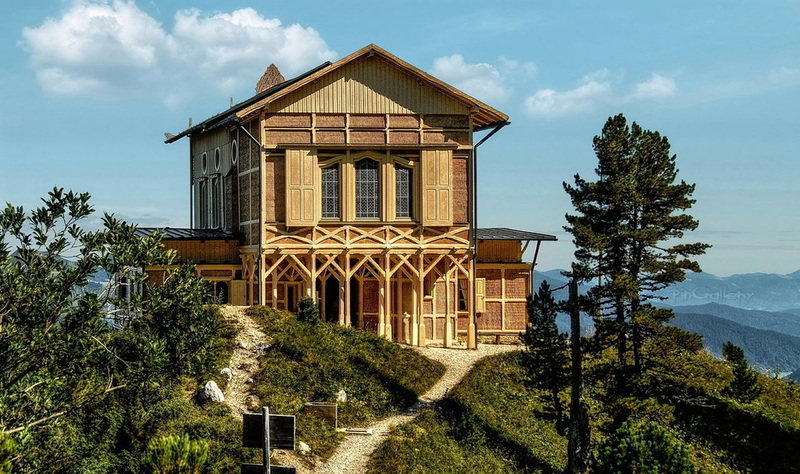 The King's House on the Schachen: The wooden building with its rather plain exterior conceals a hall on the upper floor furnished with oriental splendor. 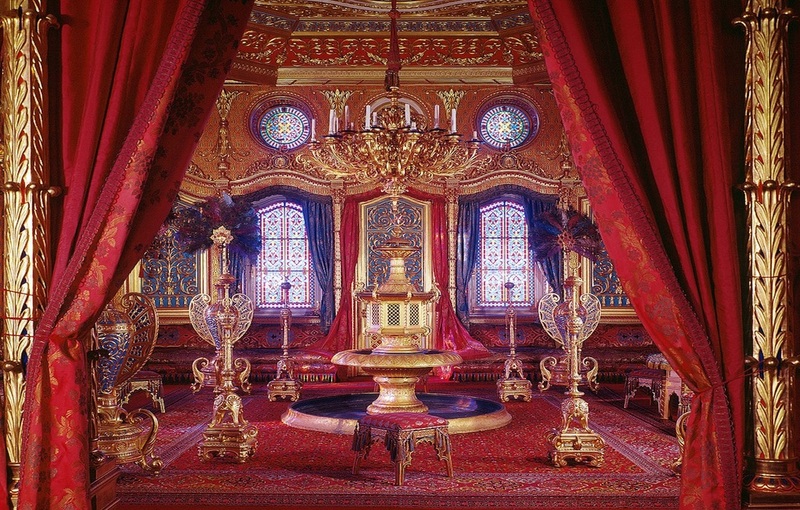 The king sought the seclusion of the mountains to celebrate his birthday and his name day in the lavishly decorated Turkish Hall furnished with divans and a fountain.The King's House can only be reached on foot. 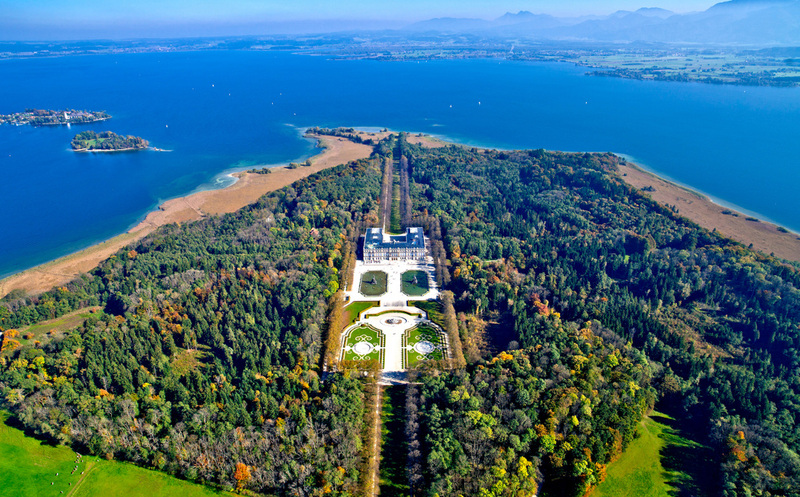 Herrenchiemsee Palace (New Palace): This palace was conceived as a Bavarian Versailles in honour of Louis XIV of France. Although when Ludwig IIdied in 1886 building was still in progress, the costs of this huge complex were already higher than those of Neuschwanstein and Linderhof put together. 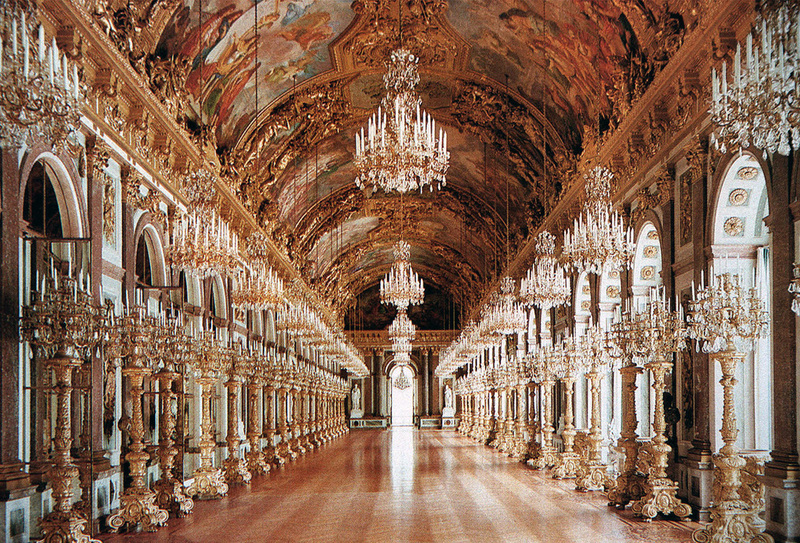 The Mirror Gallery, almost 100 metres long, was lit by over 1,800 candles. 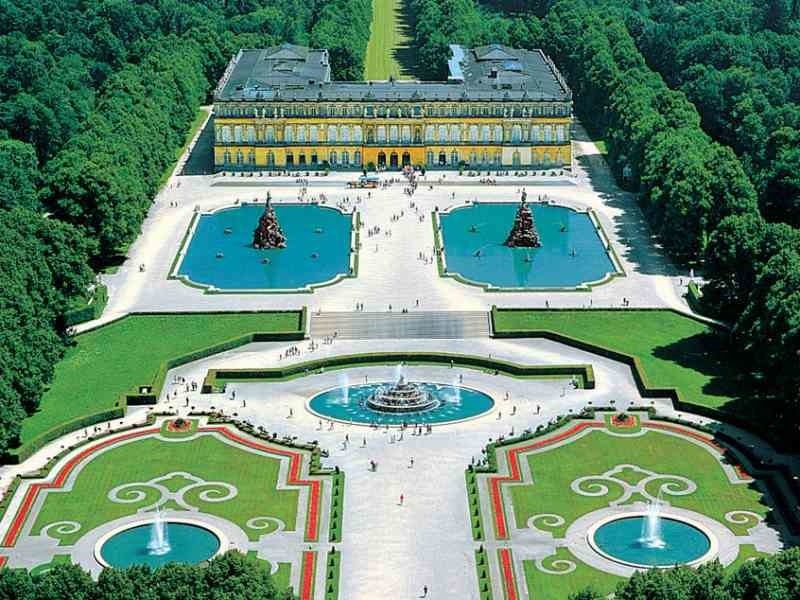 The geometrically designed French gardens with their famous fountains represent only a part of what was originally planned but never completed, and palace and gardens are surrounded by a naturally landscaped park with old trees. 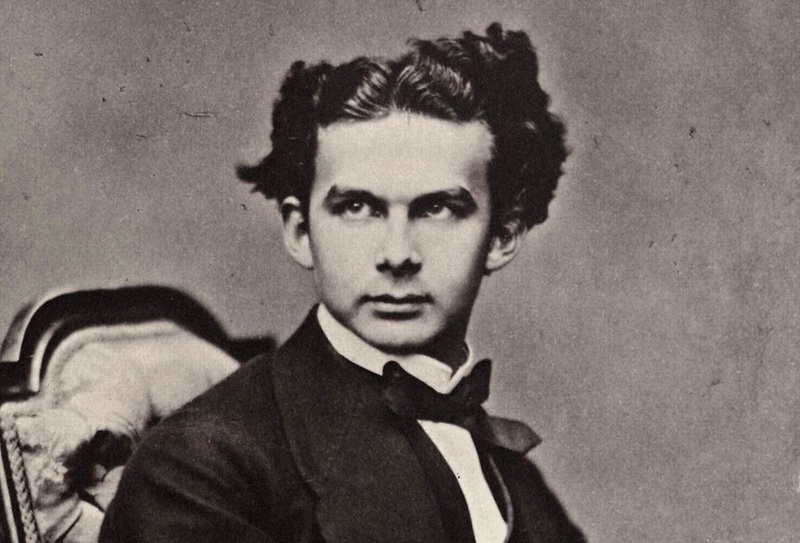 The modern King Ludwig II Museum has exhibits documenting the life and work of the king.